LOL - too funny! Have a great weekend Nancy - hope you get a bit of a break from the COLD. I got a laugh out of this! When we raised sheep, at shearing time we had to pack any brown or black fleeces separately because they brought a premium price. 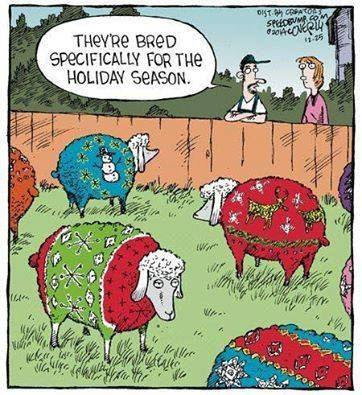 Imagine the premium prices of those holiday fleeces. Love this picture. If only. It sure made me smile this morning. Haha. Once again I think you could be an honorary Kiwi. That cartoon is so Kiwi humour. I love this cartoon so much! Thanks for sharing. Too funny! This looks like some fleece I would enjoy processing!